The Zambian Central Statistical Office (CSO) has recently announced that the country’s annual inflation eased by first time in the last 10 months to 22.2% in March, 2016, from 22.9% in February, 2016. The announcement was done by CSO Director John Kalumbi, whom in a recent press conference explained that even though overall prices rose by 0.5% from February to March, 2016, the annual inflation rate slowed due to non-food items. Non-food inflation decelerated from 19.1% in February, 2016, to 17.9% in March, 2016, since certain products as imported motor vehicles, charcoal, firewood, and household cleaning products saw their demand and prices reduced, Mr. Kalumbi added. 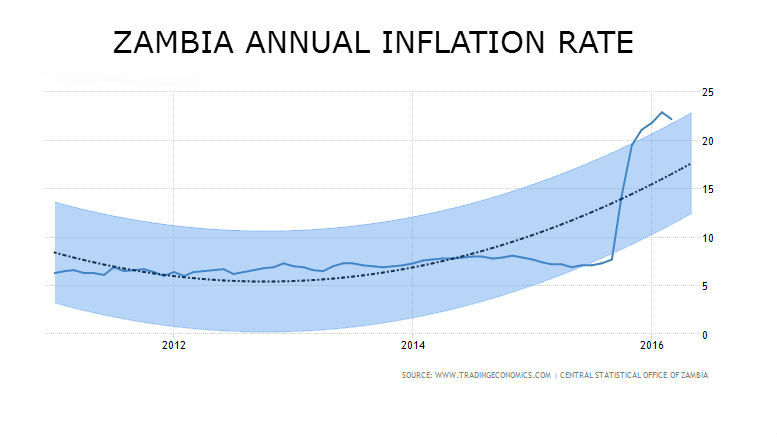 According to Bloomberg, Zambia’s annual inflation had grown from 7.7% in September, 2015, to a historical maximum of 22.9% in February, 2016, due to slumping copper price from approximately USD 5,500 per tonne to USD 4,500 per tonne in the same period. The copper price fall together with other factors such as electricity shortages that reduced the availability of power supply and reduced local businesses’ output, contributed to plunge the Zambian Kwacha (ZMW) from approximately ZMW 8.56 per USD in September, 2016, to an average of ZMW 11.46 in February, 2016, according to the same source. This is why the Bank of Zambia (BOZ) decided to raise the reference interest rate from 12.5% to 15.5% in November, 2015, on an attempt to halt the country’s increasing inflation rate. The interest hike helped to ease the growing inflation which almost tripled between September and November, 2015, while in the following periods towards February, 2016, it has been almost flat around an average of 22%.